Scotland at Easter has become somewhat of a standing event in my calendar - there's only been one Easter in the last decade that hasn't seen me making the 500 mile pilgrimage to the Scottish Highlands. It is certainly one of my favourite spots in the world & there's a definite sense of calm that descends as you wind your way north past Loch Lommond, climb high up on to the beautifully wild Rannoch Moor and come face to face with still taller peaks of Glen Coe and in particular Buachaille Etive Mor. This year's trip took advantage of the two bank holiday weekends and so, by Friday lunch time I was sat in the bar at the Bridge of Orchy Hotel with my wife and paddling friends from various parts of the country trying to decide what to do: the sun was shining and the river levels were very low. Luckily in Scotland low levels don't equate to no paddling & we decided to head to the white water play park that is Glen Etive. 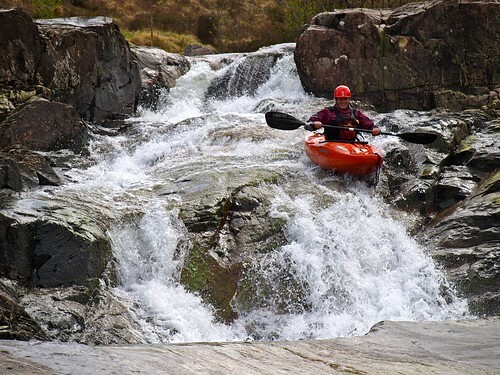 One of my favourite sections of river up there is the Allt Fhaolain - it's one of those park and huck runs where you park at the bottom and different levels mean different sections are paddleable. 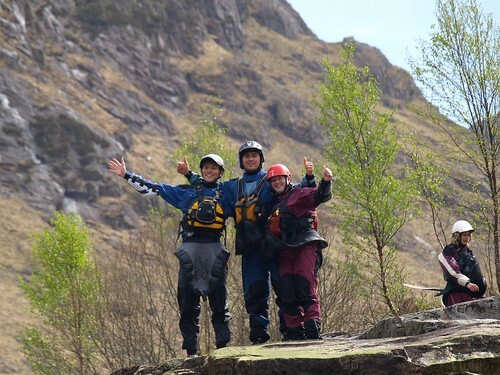 It was running low, so we decided to hike a couple of boats up the river for us all to share as we worked our way back down stream in a combination of kayaking and canyoning I like to call canyaking.. The most paddleable features were Steve's slide: a 25m slide into a cauldron pot which was also great fun to slide down sans kayak; the double drop, which is a sweet double waterfall in a slot that is almost wide enough for paddles and the final drop which has an unpleasant rocky entrance, but is then a clean 3m fall into a beautiful blue pool. We were all giggling the whole way down - a thoroughly great way to start the trip. After food at the Clachaig (a great pub that has unfortunately gone down hill in recent years). We ended up camping in Glen Etive that night, along with a lot of other people - a lot of whom didn't understand the principles of low impact wild camping & had huge tents, generators, large bonfires and toilet tents. We awoke early, met the rest of our group who'd been driving up over night and headed off to Morrisons for a traditional scottish breakfast. We checked into the Little Houses in Roy Bridge (a great place to stay when you're next up there) and headed off down the perennial favourite low water run: the Spean Gorge. 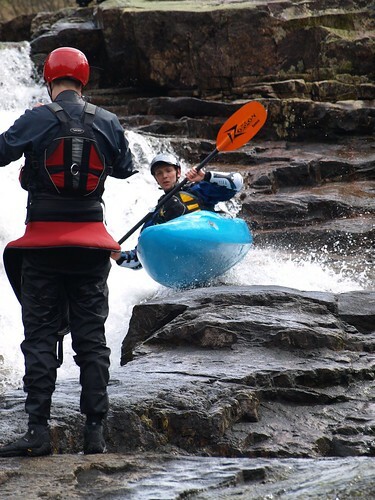 It's one of the very few British rivers that is paddleable 365 days a year, thanks largely to the Laggan dam upstream and the nature of the rock gorge that means all the way from compensation flow to a 6 pipe release the gorge is good to go. In low levels it's a technical 3/4(5) and good fun, but if you drop your guard it'll catch you out (I had a roll after getting pushed against a cliff by a boil). What followed was a fantastic week of relaxed boating with friends. We'd generally get up early for tea and porridge before driving a long way to a river and then come back via a pub to a meal we'd stuck in the slow cooker. We had one day off for biking at the great Laggan Wolf Trax - despite one of our group not having ridden a bike since she was a kid - she did really well and even managed to execute an unintentional somersault dismount into a muddy ditch without damaging herself too much. Despite the low levels we were able to find a fair few new rivers to paddle (new to me anyway). The best of the bunch was the Meig gorge, also paddlable on compensation flow, it's a steep walled in grade 4 run, but is quite forgiving (esp at low levels) and has scouting and portage options where necessary. It's a must for any low water Scotland trip. 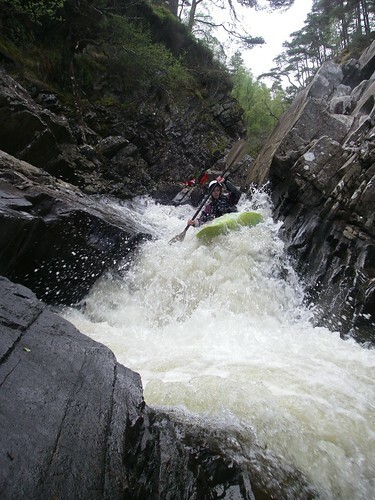 Also new to me was the Randalph's leap section on the Findhorn and a run I've not done for ages is the Allt a' Chaorainn - a silly little park and huck in Glen Etive with some impressive drops and slides. Off river highlights included a great 8th Anniversary meal with Sharon at the Glenspean Lodge Hotel, beers at the only floating pub on the the Caladonian Canal - The Eagle Barge and discovering that The Kings House near the entrance to Glen Etive not only goes great food, but also encourages responsible wild camping right next to it. The award for the most lavish post pub snack has to go to Loz for preparing and roasting a pheasant he saw the car in front of him hit. All in all, this was one of the best Scotland trips I've had in a long time, so thanks to Jacob for organising it and to Sharon, Ben, Iain, Stuart, Loz and Millie for making the Highland Pilgrimage too.